Good afternoon!! Welcome to our inaugural blog hop of the Amazing Paper Grace Die of the Month. Today we're here to pump you up with some inspiration for the many ways and many colors to use the Die of the Month as well as to give you the skinny on the club. 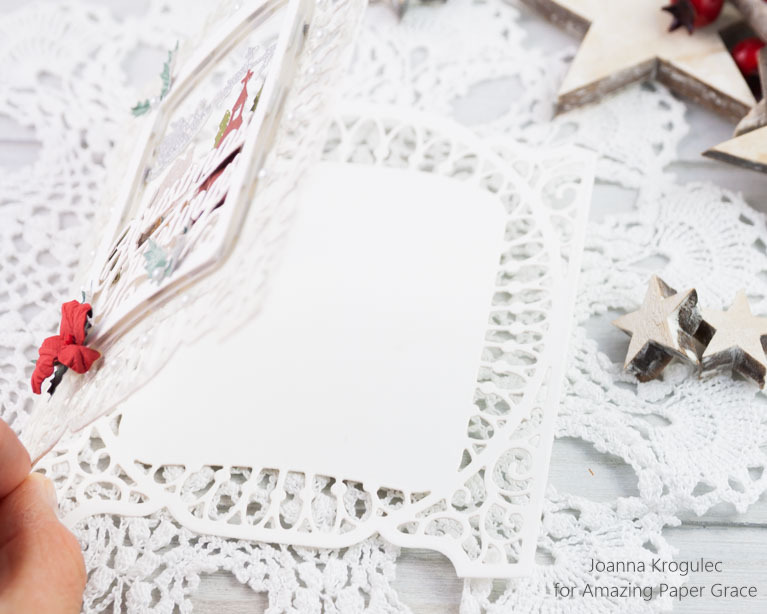 Stay tuned until the end of the post when I'll point you to the next inspiration stop in our blog hop. When most of Becca's dies come out they are themed collections of 12 to 14 dies. These are the dies that are more specialized that she didn't want to build an entire collection around - they are definitely Becca's style but she's built extra functionality and thought into these sets. You all have spoken loud and clear to say that you have a monthly budget and that you want Becca dies all year long without breaking the bank. Well, here you go. Don't worry, collections are not going away but streaming them out on a monthly basis you'll see one once a month and they are delightful on the budget. 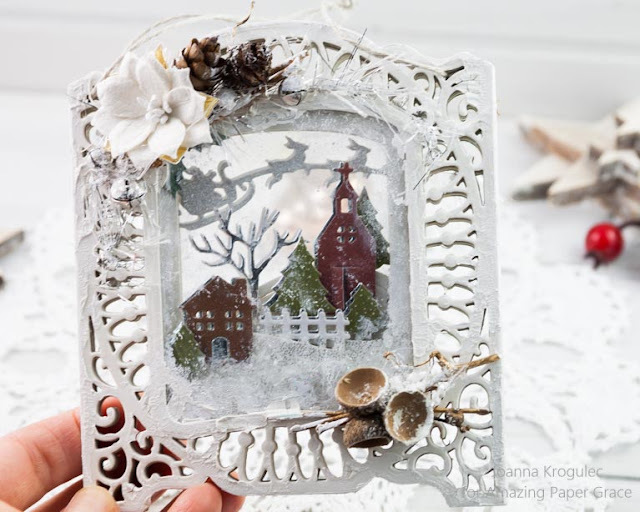 This month's die is called Christmas Village Vignette Frame Die. If you look closely you'll notice that it looks a whole lot like the popular 3D Vignette Grand Cabinet. That's no accident - Becca likes to make things that work together and add value to what's already in your stash. No worries though, you don't have to have 3D Vignettes to use this die. Here's what I decided to make. 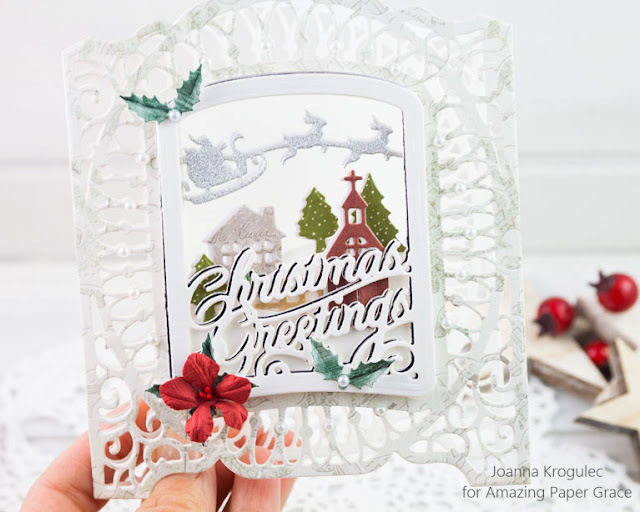 Using the Die of the Month I made a filigree card, tags and Christmas ornament. First I folded a card stock in a half and then die cut the frame to give the card a shape. 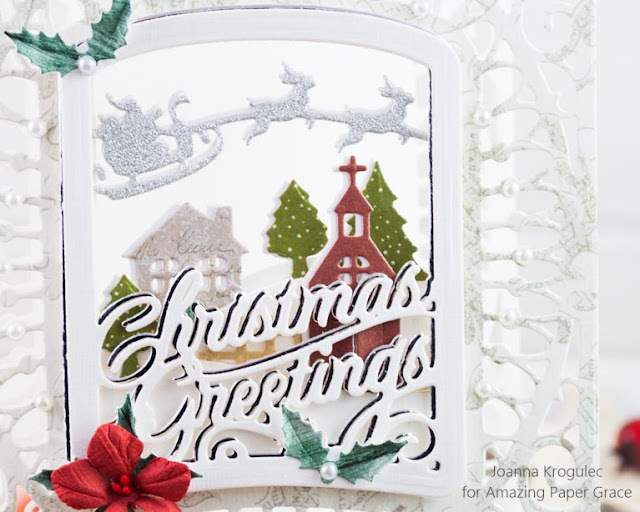 Then I die cut decorative panel at the front and then at the back of the card. 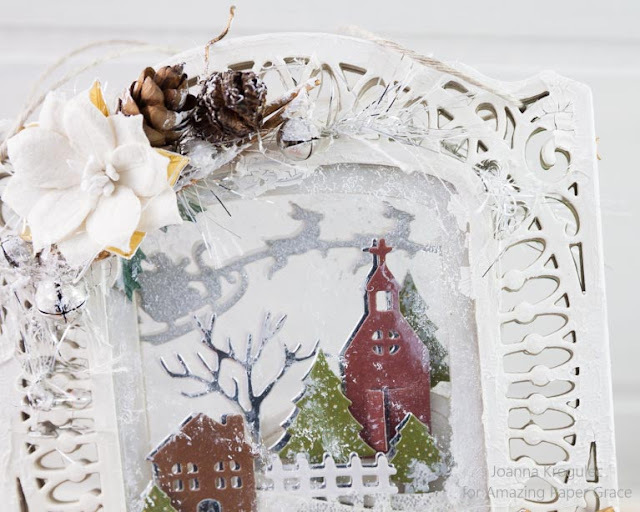 I decorated the front of the card creating a winter scene. 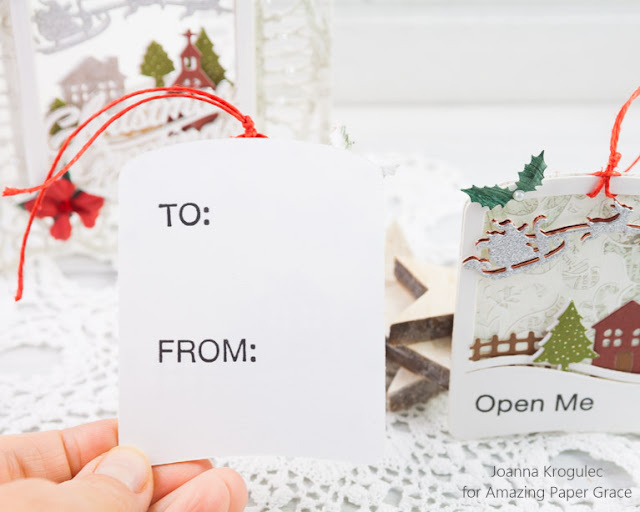 The front of the card is see through. 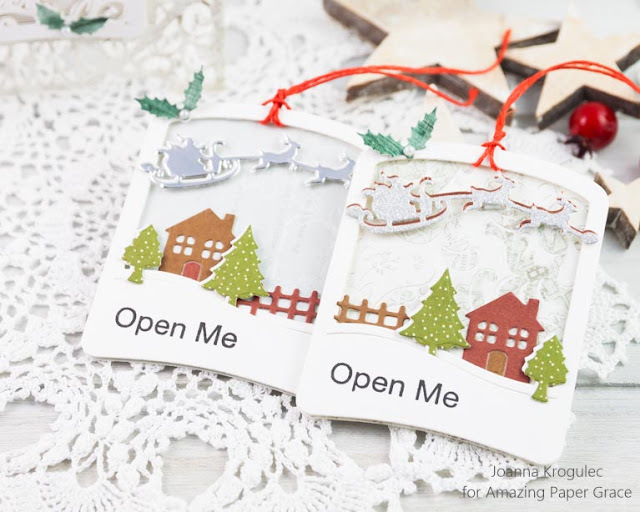 My second make are Christmas tags. I created them using the decorative inserts. The shape is an outline window frame and I layered it, on 3D tape, with a panel that I die cut using together outline and snow insert dies. My third make is a Christmas ornament. I created the ornament by die cutting ten panels from cardboard (I used corn flakes cereal box). I secured together outline and the decorative insert. I die cut with ease in cardboard. 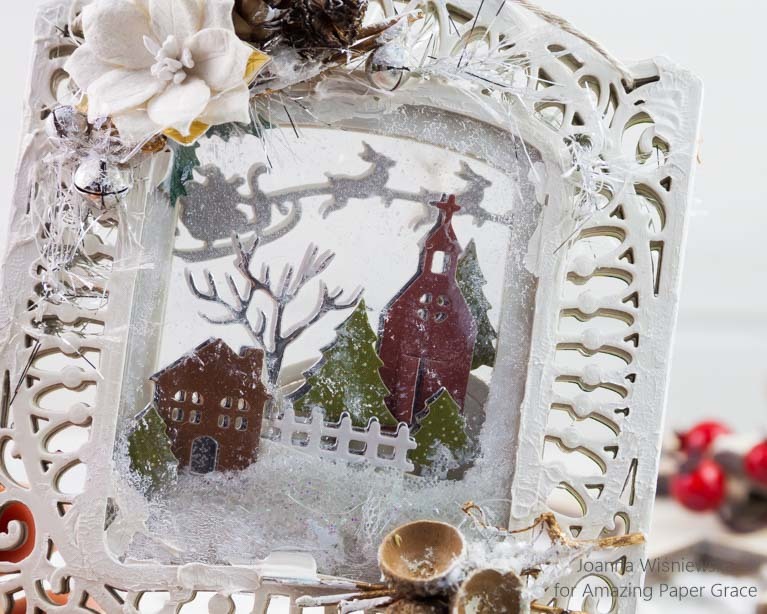 The I added a decorative insert and die cut all three dies together so I had two panels with snow where I could add house, church and trees. Twelve layers in total. 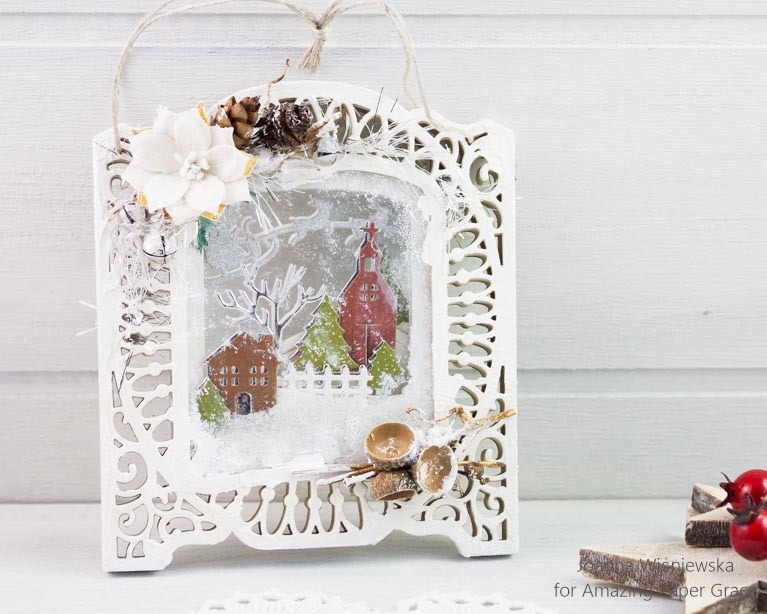 I created this ornament the same way I made my other ornaments. You can find a tutorial ---> here. At the front and the back I added a acetate to create a shaker inside. 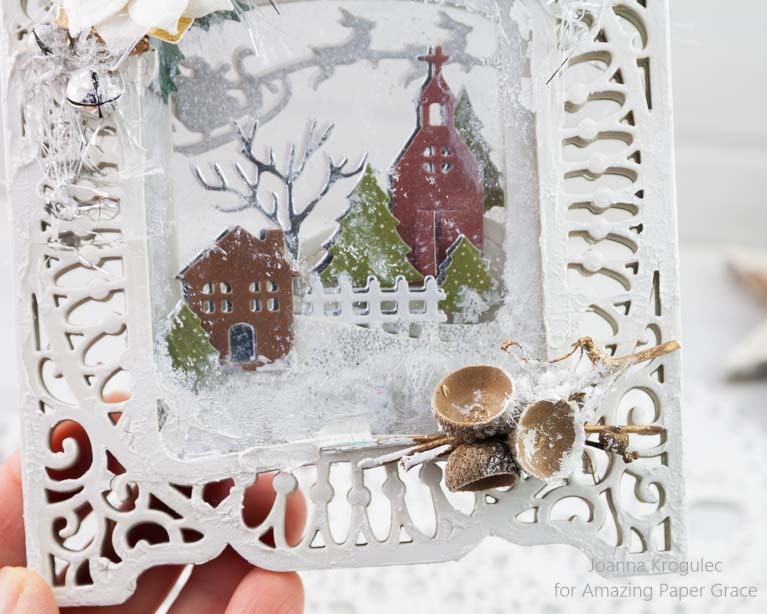 I added some crackle paint and some splashes of white acrylic paint here and there to create a snowy effect. There is much more inspiration in store for what you can use this die set for. 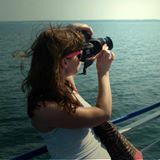 Just pop down the list of Creative Team Members to see more! Simply beautiful all of them. JoAnna, You made it look natural with the coloring on the buildings rather than just the white to make it look like snow. So many have houses that are color and it is quite realistic. TFS! 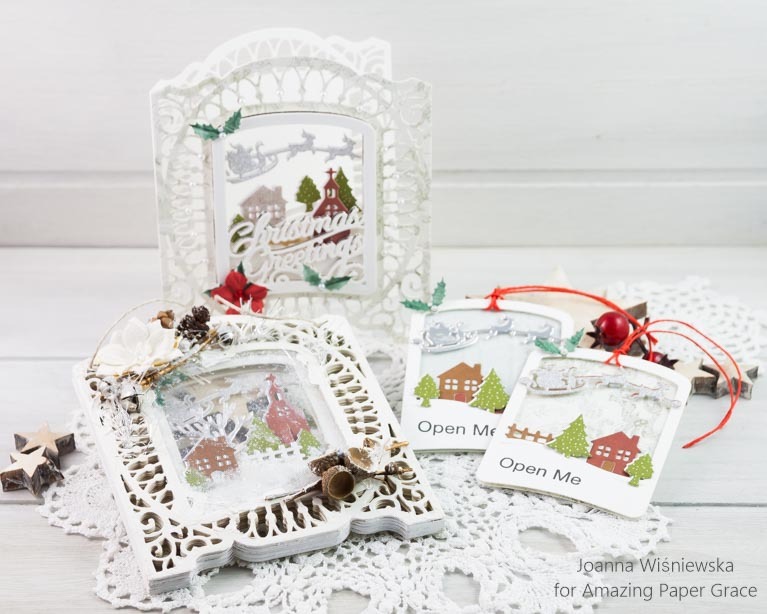 Lovely projects with beautiful dies! I think congratulations are in order - did you get married? Happy Wishes! You have such great ideas - your shaker ornament is so well crafted it looks down right frosty! Hi Joanna, I adore your cards, very well done. I especially love your tag, very inventive and planned out. Merry Christmas to you!